After the mid-December arrest of terrorists in Jordan, many of our friends doubted the wisdom of a trip to the destination just over a month later. We continued with our plans to visit the Middle East nation. It was a wise choice. For the next week, we enjoyed the hospitality of the friendly Jordanians. Landing in the capital city of Amman, we were greeted with a clean, modern city, a place where all travelers are welcome. We went out to see for ourselves–to explore the land that is filled with cultural, religious and natural attractions. “People say Amman is one of the cleanest and most organized cities in the Middle East,” explained our knowledgeable guide, Kamel Juyusi. Sometimes nicknamed the “white city” for its use of limestone, the modern capital sprawls across 21 hills. In the hills lie many of Amman’s top hotels, such as the Grand Hyatt and the Radisson SAS, with more internationally recognized chains under construction. The hills also are home to many of the city’s historic sites. We headed to the Citadel, where the Temple of Hercules has overlooked the region since 156 AD. Beneath the temple lie the remains of a 6th century BC temple built to replace an earlier temple destroyed by King David. Standing just yards from the temple columns, we had a sweeping view of the city, from the Raghdan Palace where King Hussein now lies buried in a simple grave, to the bustling Hashemite Courtyard, filled with midday shoppers and local residents enjoying a cup of coffee (an omnipresent sight of hospitality throughout Jordan.). We could also view our next stop, an amphitheater built to seat 6000 Romans. But before exploring the rest of the city, we first made a stop at the Jordan Museum. Compact enough to be seen in about an hour, the museum is best known for its exhibits of the Dead Sea Scrolls. Heading north of Amman, we continued to Jordan’s second most visited site: Jarash. Located just 45 minutes from the Syrian border, the site was one of the Middle East’s most prosperous cities in the 2nd century with over 30,000 residents. 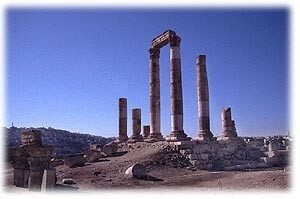 Today the ancient city is well worth a day trip from Amman. “Here you feel like a Roman walking through history,” explained Kamel. “You can imagine how many people traveled through here — you can even still see the chariot tracks.” We followed those tracks down the Roman Cardo, lined with ancient columns. From Jarash it was a short drive to the town of Ajloun and to one of Jordan’s most beautiful castles. Tucked high on pine forested hilltop, the Qala’at Ar-Rabador Castle of Ajloun was built in 1184. From its lofty heights, we could view the Jordan Valley; in the distance, obscured that day by haze, lay Tiberias Lake or the Sea of Galillee. The next day we headed south of Amman to Madaba, nicknamed the “City of Mosaics.” We quickly learned why. The city is home to hundreds of mosaics dating from the 5th through the 7th centuries but the most famous is in the Greek Orthodox Church of St. George. Although only a portion of the original 25 x 5 meter map remains today, the map assisted Biblical scholars in locating sites throughout the region. Like a treasure map, the mosaic of St. George’s Church once held the secrets of many holy sites. Constructed in the 6th century of two million stone pieces, the mosaic map depicts sites such as the cave where Lot and his family hid as well as more distant locations such as the Nile Delta. Just 10 minutes from Madaba lies Mount Nebo. Soon to be the site of a papal visit, Mount Nebo is thought to have been the place of Moses’ death. A chapel filled with mosaics was built here by Byzantine Christians but the most important part of the site lies outside– the view Moses once enjoyed across the Jordan Valley and across to Jerusalem and Bethlehem. Jordan’s newest attraction is also one of its oldest. The Jordan River Baptismal Site was long off limits to both travelers and archaeologists, due to thousands of land mines that dotted the area. After a peace treaty with Israel and two years of clearing the mines, archaeologists began to excavate the site of Bethany where John the Baptist is said to have baptized Jesus Christ. With a spring 2000 opening of the site and a planned visitors center, the baptismal site will welcome travelers–but not for the first time. “This site had pilgrims from the late 4th century,” said Sa’ad Hadidi, archaeological inspector. Those early pilgrims built baptismal baths and today’s visitors will see those stone structures, followed by a tractor ride to the river itself. We felt like explorers ourselves heading into the quiet sik, the stone chasm, in the early morning before the crowds of day trippers arrived. With only the occasional clop of horses’ hooves echoing against the canyon walls, we made our way into the siq, a narrow passage with pink sandstone walls. Once caravans filled with treasures from Africa and Asia made their way through this passage to trade with the Nabateans, the residents of Petra. Over 2,000 years ago, these traders carved their city into the soft rock, constructing elaborate buildings and tombs using a mixture of Greek, Roman and Egyptian styles they had admired on their travels. Soon we got a peek at the most recognized site at Petra: the Treasury. Carved using only a chisel and hammer, the urn atop the magnificent building was thought to have housed a pharoah’s wealth. Although it is the most recognized site at Petra, the Treasury is just one attraction in this park that contains everything from royal tombs to a Roman amphitheater to mosaics. “Taxi, taxi,” a young boy shouted at us from atop a donkey. Accepting his offer, we rode sure-footed donkeys up steep paths to the hilltop where one of Petra’s largest buildings is carved in a cliffside. The massive Monastery, similar in appearance to the Treasury but on a grander scale, is seen by far fewer travelers than its better known cousin. 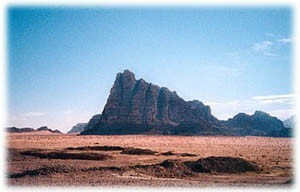 From here, travelers can take a path to a lookout for a view of Mount Aaron, where the brother of Moses died. the British soldier helped lead the Arab revolt against the Turks during World War I. In many ways, it was a description that would fit the country of Jordan as well. In a week of exploration, we had just touched on the country that offers so many historic sites. And while it was the lure of those ancient sites that brought us to this country, it was the friendliness of the Jordanian people that stood out most in our minds. 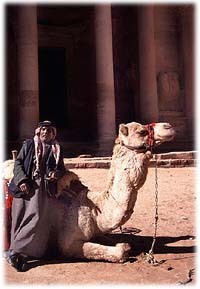 For more about travel in Jordan, see the Jordan Tourist Board site at http://www.seejordan.org.